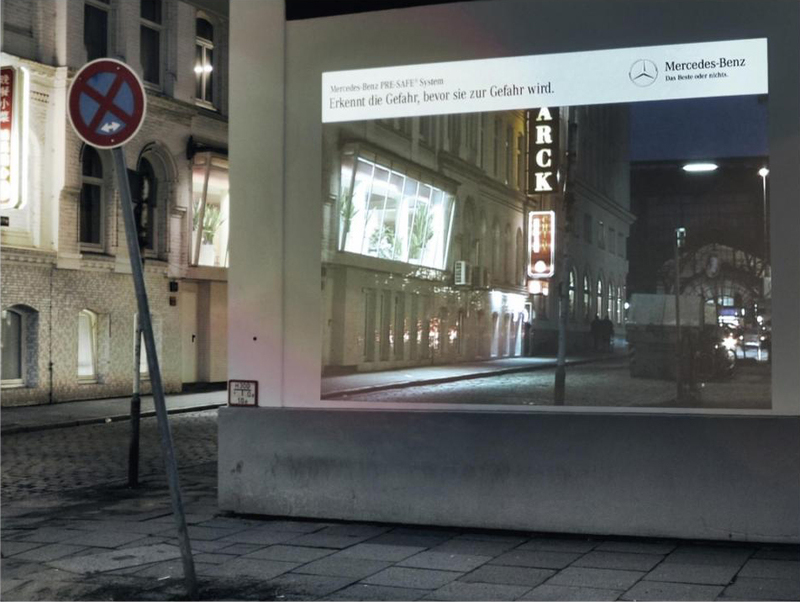 The Mercedes-Benz PRE-SAFE® precrash system was given a work-out on a street corner in Transparent Walls, a campaign launched in Hamburg, Germany. Special billboards allowed people to look around the corner, as if they looking through transparent walls. The effect was created by projecting images from a video camera on to a corner billboard. Motorists and cyclists could now see potential hazards in time to avoid them, precisely the concept behind PRE-SAFE®. The promotion not only explained a complicated product, but also made traffic a little bit safer. The campaign won a Silver Outdoor Lion at Cannes International Festival of Creativity, 2011. The Transparent Walls campaign was developed for Daimler at Jung von Matt/Elbe, Hamburg, by executive creative director Sascha Hanke, creative directors Jo Marie Farwick, Jens Pfau Jung, Tobias Grimm, art directors Benjamin Busse, Damjan Pita and Frederico Gasparian, copywriters Florian Hoffmann, Henning Robert, Jan-Hendrik Scholz and Alphons Conzen, graphic designer Samuel Huber, interactive producer Sascha Kurfiss, account manager Dajana Crantz, account assistant Marijke Fißer, account supervisor Sven Doerrenbaecher, and agency producer Jannik Endemann, working with Mercedes Benz marketing team Anders-Sundt Jensen, Lüder Fromm, Damir Maric, Lena Ernst. Filming was shot by director Mortimer Hochberg via Erste Liebe with director Justin Mundhenke.